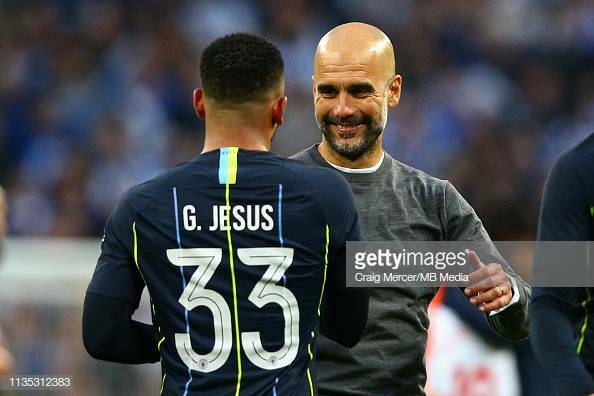 Pep Guardiola(right) smiling and chatting with match-winner Gabriel Jesus(left) after their FA Cup Semi-Final win. Image courtesy of Craig Mercer from MB Media on Getty Images. Manchester City manager, Pep Guardiola was happy that his side made the final and keep their dreams of the quadruple alive after their 1-0 win over Brighton in the FA Cup Semi-Final. Speaking to ManCity.com Guardiola said: “I am happy to be in the Final. We extend our season by one more week and we are happy for that. “It’s almost impossible to win the Quadruple. Surviving is a miracle and it’s nice to be there." Guardiola was keen to silence people who were talking about Manchester City winning the quadruple: "My opinion is that nobody has done it so why can we do it? It is almost impossible to achieve everything – that is the truth. “Today, we didn’t ‘conserve energy’. If it’s 3-0 or 4-0, then fine – but this was absolutely open until the referee said it was the end." Benjamin Mendy started and impressed Guardiola: “He arrived at the by-line many times and it had been a long time since he played.